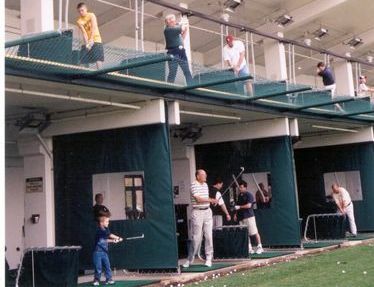 The Libertyville Sports Complex’s state-of-the-art Driving Range was voted “Best Driving Range in Chicago” by the Daily Herald, and won their Readers’ Choice award several years running. 30 automated, weather-protected tees, 50 outdoor tees, and grass tees, a putting and chipping green to work on your short game, too. And we have lights for night time practice. If you’re looking for lessons, you can book some time with our professional instructor and start learning the game or improving your game. Open every day, all 12 months. With two distinct outdoor courses, the Aloha Falls Miniature Golf Course is a great way to unwind. If you feel like taking it easy, check out the simpler, more relaxed Beach Course. On the other hand, if you’re in the mood to put your short game to the test, the Waterfall Course, dubbed “One of the most difficult miniature golf courses in Chicagoland,” will definitely make you work for your par. No matter your skill level, Aloha Falls promises to be a great time for family members of all ages.